No one seems exactly sure what it is, but Kansas seems to be the nation’s hotbed of girls javelin throwing. It takes no more than a look at last year’s national leaders to figure that out as three of the top five were from the Sunflower State. Two of those three have moved on to collegiate throwing, but carrying the torch at the top of the national lists this year is Concordia senior Heather Bergmann, who reached that plateau last weekend with her 160-05 in her regional meet. Getting there this spring wasn’t easy for Bergmann, however. Throwing the spear is just one of many endeavors she puts her heart and soul into, and this past winter and early this spring it was basketball, as the three-sport senior helped lead her team to a 4A state championship and undefeated season. That gave her a later-than-usual start on the track. Bergmann has also been class president each of her four years (she is now student body president) and maintains a 4.0 GPA. Her athletic and academic focus will sharpen next year, however, as she plans to compete for her home state Kansas Jayhawks in track and field. But for now, it’s this weekend’s state meet, a hoped-for first state title and big PR (her 165-06 from last year is #7 all-time with the post-2000 implement), and a possible return to post-season action, of which she hasn’t participated since the 2007 Golden West meet. Before she headed to Wichita, however, Heather Bergmann took time for a few questions with DyeStat senior editor SteveU. 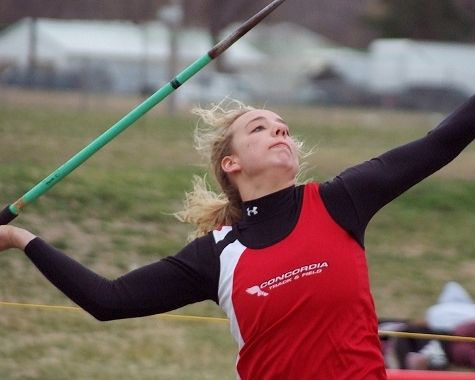 1) Heather, congrats on breaking through to 160-05 in the javelin last week, a seasonal best. I know you’ve gone beyond 160 each of the last three years now. What did it take to get back to that milestone again this year? Was it any harder than previous years? This year was a little bit different from previous years. I started track practice a couple of weeks late due to our basketball team making it to the state finals. It's taken a lot of mental and physical preparation throughout the entire year to get where I am now. I was a little worried that I wouldn't hit 160 this year, but I know now that I am peaking at the right time. I'm so used to getting that big throw in the middle of the year that I was afraid it wasn't going to happen. 2) Now you have your state championship this weekend … do you feel like you’re ready to hit a big PR and maybe even that 170-foot barrier that would push you up higher in the all-time elite? Or is it more important to focus just on winning and possibly scoring points in other events? I definitely feel confident that I can throw another PR this weekend. It's everyone's dream to get that one big throw at the state track meet, and I know that it can happen. I've got a lot of mental preparing to do. I also realize that it will be difficult to win the meet this year as there are still many good throwers in the 140 range. I will also be competing in the shot put, and I hope to score some points there, too. However, my main focus is the javelin. 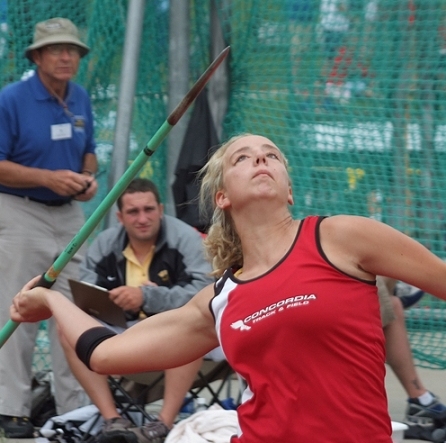 3) Kansas seems to be the Mecca for girls javelin throwers. Last year, Roxy Grizzle, you, and Katelyne Penner finished 1-4-5 on the national list. What do you think it is that makes this event so good in Kansas? The coaching? The winds? Or is it just a great rivalry the three of you had? Were you good friends with those two girls and do you miss them at all now that they’ve graduated? I don't know why Kansas has all the good girls javelin throwers. Maybe just a coincidence? I know I have been blessed with great talent and a great coach. I know that all three of us were fueled by each other to keep climbing that throwing ladder. It helped to have other really good throwers to compete against last year. I wasn't able to establish a friendship with the girls since we only saw each other at a couple of meets. We kept to ourselves most of the time. 4) Although you were the 4th-ranked thrower in the country least year, you didn’t compete at Nike Outdoor or USATF Juniors and I don’t recall you threw in any other post-season meet. Was there a reason you decided not to throw at any national-level meet, and do you plan to try one or more of them this year? I didn't compete in a national level meet last year. However, the prior summer, I placed third at the Adidas Golden West Invitational. There really is not a reason that I didn't compete last summer. I am kind of an in-the-moment athlete, so I'm not for sure about this summer. 5) I read that you were an outstanding post player on your school’s state championship basketball team. Can you tell me a little about your overall sports background, and how basketball, volleyball and track fit together in your life? Do you enjoy track the most, or one of the others? Sports has been a huge part of my life since I was little. I have an older sister who I watched play volleyball, basketball, and track. Everything I do is in tune with my athletic career, from when I go to bed to my weekend activities. It is nice to get a break every now and then; however, this is all I've ever known. We have quite a few senior girls who play three sports. These girls are a nice support system for me, because they're striving for the same goals. Volleyball this year was a lot of fun. We made it to the state tournament, but didn't make it out of finals. We were a lot better than we have been in quite a few years. You have obviously read about our basketball team, so you know how the season went. Basketball taught me a lot of good life lessons. I will definitely miss playing volleyball and basketball next year. There are ups and downs to every sport, but track is probably my favorite. 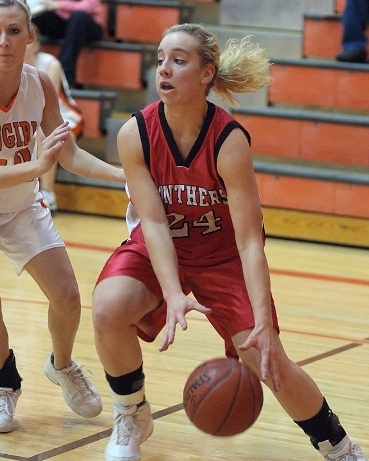 Basketball action this past winter. 6) How did you wind up mastering in the javelin? I see you also throw the shot and the discus, but it looks like jav is your best and favorite event. Also, can you talk about the coaches you’ve worked with and how they’ve helped you to get to this level? I actually didn't plan on throwing when I started track in junior high. One of my coaches (also a parent of one of my friends) told me that I should try the javelin because I would be good at it. So I gave it a try. We only threw a few meets in 7th and 8th grade, so I didn't get a lot of experience. In high school, we got a new throwing coach, Coach Corey Isbell. He revamped my form, and I found out I really did have a knack for it. Coach Isbell has been there for me every step of the way, and I am truly grateful to have him as my coach. As for head coaches, we've had four different head coaches since I've been in high school. They have all been extremely supportive. Coach Wachs, our head coach this year, is always there to watch me throw (when he can). At regionals, even my basketball coaches, Coach Derek Holmes and Coach Kevin Johnson, were there to support me. They are always interested to know how I am throwing. Overall, I couldn't ask for more supportive coaches. 7) I’ve read that you’ve signed with Kansas and plan to compete in track there. Did you think at all about a school where you could play two or more sports, or was it fairly easy to think of yourself making the transition to being a D1 track athlete and letting go of the other stuff? Since I realized my talent in javelin, I have been preparing myself to be a one-sport athlete in college. I knew that in order to make D1, I would only be able to compete in javelin. Since track is an all-year sport, I will be plenty busy. It will be difficult not to play volleyball or basketball competitively anymore at the varsity level. However, I am sure, at least, that I will play intramurals. 8) I see where you’ve been class president at Concordia every year and are involved in a lot of things besides sports … AND that you’re a 4.0 student on top of that! What have been the motivations and inspirations for you to take on as much as you have? How tough is it to balance your time out? What interests you the most academically and where are you hoping to go with it in college? Much like sports, my sister has been a role model for me in school. She was involved in pretty much everything. I am a lot like her, and I love to be involved and be a leader. I have been able to let go of some obligations in order to have enough time to do everything. My parents have always stressed good grades, and that they come before sports. It's a good thing I have good grades. Otherwise, I may not be where I am at today. In the words of my high school chemistry teacher, Mrs. Denise Stover, I am a “chemistry nerd.” I plan to major in secondary education, with an emphasis in chemistry, when I go to college. At Concordia High School, the teachers are not only interested in me as a student, they are interested in my activities and my future. 9) Can you tell us a little about your family and what kind of support they’ve been for you as an athlete? Were any of them athletes themselves? And finally, when you’re not doing sports or studying, what are we likely to find you doing for simple fun? Are there any special interests that few people know about Heather Bergmann? My family is the best. I have a quite large extended family. I have many aunts, uncles, and cousins who are always sending me newspaper clippings or coming to watch me throw. My grandparents are very supportive of my efforts. One of my grandmas lives in Concordia, and she is always there watching me, whether it's volleyball or basketball or track. My parents, Dennis and Annie Bergmann, are beyond words when it comes to their support during track season. Sometimes it's hard mentally, and they are always there for me. They come to every meet, and they each have there own way of supporting me. My mom is always mentally preparing me or stretching my shoulder. My dad, however, tends to stand away, but he's always there when I need a hug or a little bit of encouragement. My mom played volleyball in high school, and my dad played football. My older sister attends Fort Hays State University where she throws shot, disc, and hammer. When I am not doing sports or studying (which is not a lot during the school year), I am usually spending time with my family, my friends, or my boyfriend. I don't get a lot of time to relax, so I use my free time wisely. This could include watching a movie, reading, or lounging around the pool on warm days. Since this is my last summer with all my friends, I know that I will be spending the summer doing things with them. I am a pretty open person, so there's not a lot people don't know about me, but I am a die-hard Chinese food fan.